For customers around the world XORELLA is the preferred partner for standard conditioning and heat-setting machines as well as for equipment for integration in fully automatic material handling and packing systems. XORELLA has listened to customers’ input and reengineered the controller and its software. Latest generation hardware is used and software as well as visualization have been redesigned with a clear concept in mind: Easy operation even by less experienced staff in the mills. There is a clear structure on all screens and the use of text was minimized. At the right side actual hazards are displayed with pictograms (such as high temperature in the picture below). Handling and setting of the steaming programs was also simplified and programs can now be identified by alphanumeric names (max. 50 characters). A new interface was created to assist customers in trouble shooting. Actual and historical data is saved and can be sent to our Service Department for analysis and support. Paving the way for Big Data is the most important feature of the new XORELLA controller. It fully relies on its OPC UA interface for connection to external systems. Customers have the possibility to display the visualization on their own system completely by accessing the variables provided by the OPC UA. This considerably facilitates integration into superordinate systems. 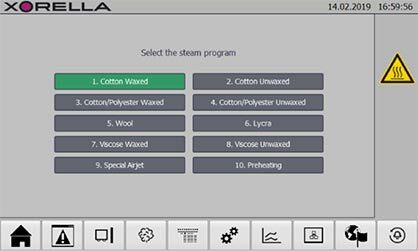 Therefore it is possible to link the XORELLA controller with process visualization systems provided by the main spinning machinery manufacturers or third parties. You are invited to meet XORELLA’s team of specialists at booth in hall 6 at booth D203 to obtain detailed information on XORELLA machines and services.